My bride surprised me with a Tatuaje Lancero Sampler a few days before Father’s Day. 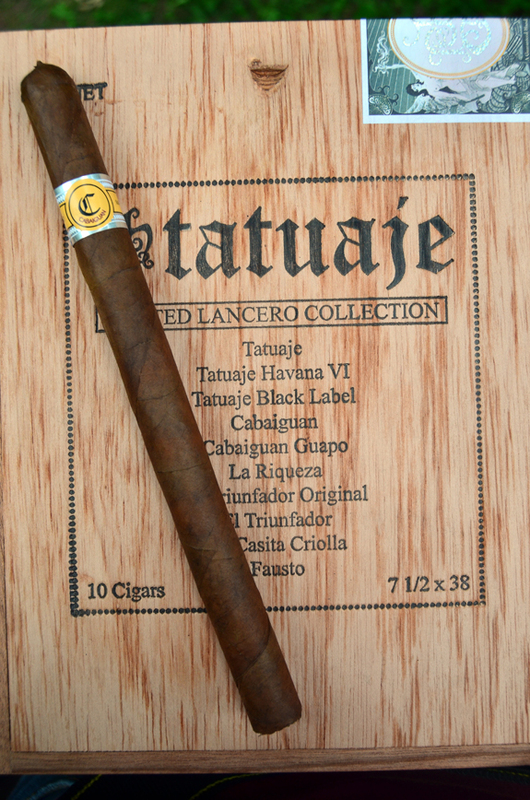 The sampler features 10 highly acclaimed cigars from Tatuaje all in a 7 ½ by 38 Lancero vitola. 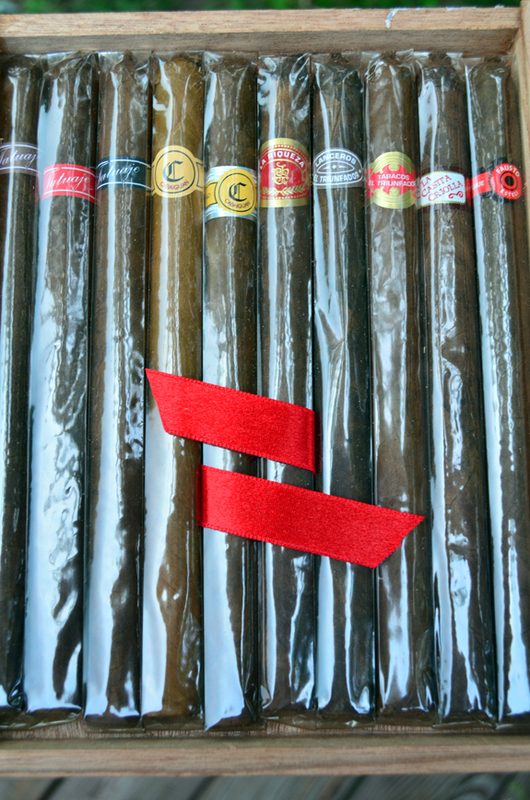 The sampler includes Tatuaje (Brown Label), Tatuaje Havana VI, Tatuaje Black Label, Cabaiguan, Cabaiguan Guapo, La Riqueza, El Triunfador Original, El Triunfador, La Casita Criolla, and Fausto. 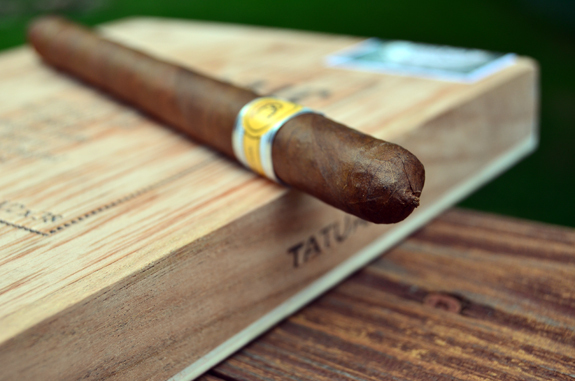 Today, I bring to you a review of the Tatuaje Cabaiguan Guapo Lancero. The Cabiguan Guapos is made in Esteli, Nicaragua at My Father Cigars S.A., the factory responsible for most of Tatuaje products. Available sizes include 5 5/8 by 54, 5 by 50, 5 5/8 by 46, 4 5/8 by 42, and 7 1/2 by 38. Tony reviewed the 5 ⅝ by 54 Gaupo here. 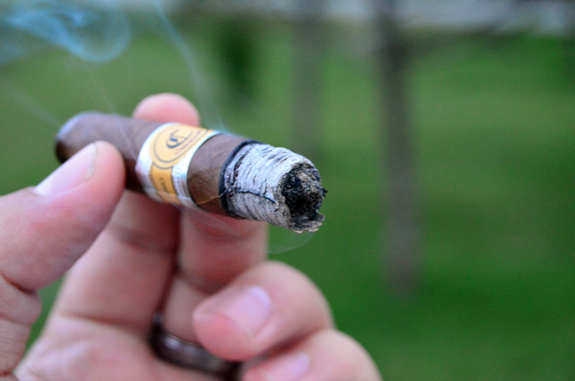 The lancero vitola of the Guapo is only available in the sampler. While the sampler will be in regular production, it will be made in limited quantities during each run. The Ecuadorian Sun Grown wrapper is consistent in its medium brown color. I am met with a pungent aroma once the cellophane is removed, along with cedar and wet earth notes. The foot gives off more of the cedar and earth with an added sweet vanilla smell. The wrapper leaf is marked with bumps and veins giving it a slightly rugged look. The Guapos Lancer0 is filled evenly all the way down to its neat, pointy cap. The cold draw is on the dry side with the same cedar and earth notes from the wrapper and foot aroma, along with a faint clove flavor. I am also feeling a spice tingle on my lips the lingers for a good amount of time. One thing I have come to expect from cigars produced at My Fathers is spice. And the Guapos does not disappoint in that area. I am met with a considerable amount of spice in the first couple of puffs that warms my mouth and lip, and leaves quite the burn through the sinuses during the retrohale. The other flavors are deep and in-line with the cold draw being of cedar and earth. As I take a smaller, shallower draw, I notice the pepper lessens and some sweetness comes through. I can’t put my finger on it yet, but it may be a vanilla-like sweetness. The finish is a bit dry with a dark fruit flavor. The burn-line is crazy thin and first ash made it past an inch. Making my way into the second third, the dry cedar has moved to the front of the profile with the unique, vanilla sweetness. The sweetness is refreshing and brings a nice balance to the smoke. The earthyness is gaining ground and an acidic citrus has joined in right around the halfway point. 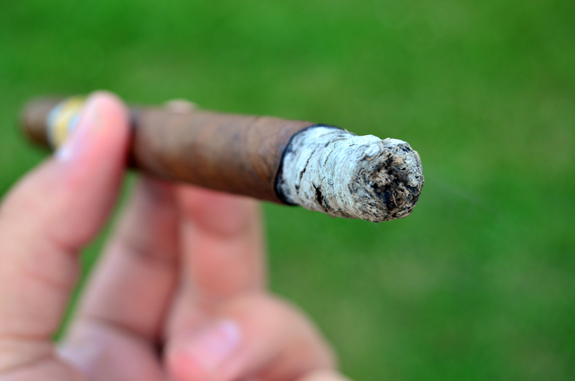 As I knock off the ash, I find a small tunnel in the center of the cigar. So far it is not having any kind of negative impact on the flavors or smoke production. Even the smallest of draws fills my mouth with a satisfying amount of smoke. The flavors are full, with the strength falling not too far behind. 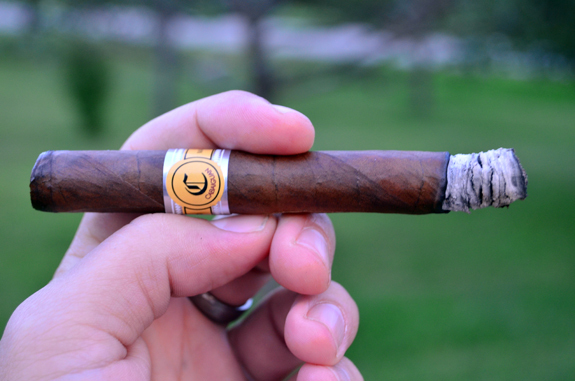 The Tatuaje Gabaiguan Guapo Lancero is still smoking cool with two and a half inches left. The pepper has calmed but in no way completely departed and the spice is still warming my mouth and lips. The vanilla I got early on is really only noticable on the finish, along with a dusty cocoa flavor. 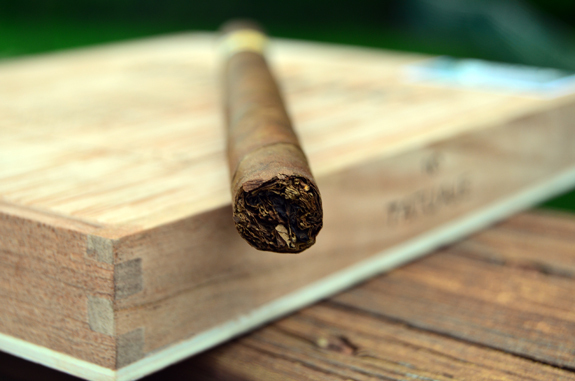 The deep cedar and wet earth notes are still holding strong as I begin to wrap up this 7 1/2 by 38 lancero. 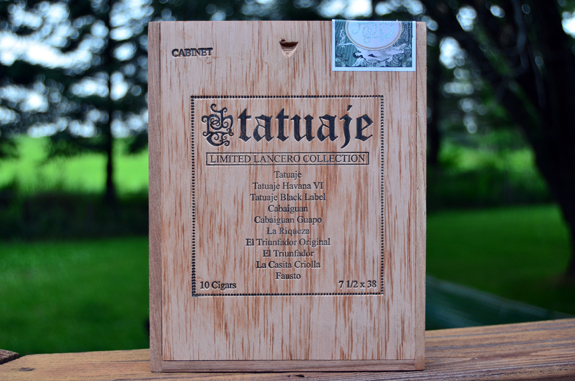 I have been a fan of Tatuaje for some time, but there were several cigars included in the sampler that I had yet to smoke and the Cabaiguan Guapo was one of those. I couldn’t have asked for a more perfect first experience with a cigar. The cigar burned cool and even. There were no touch-ups or ashes dropped in my lap. 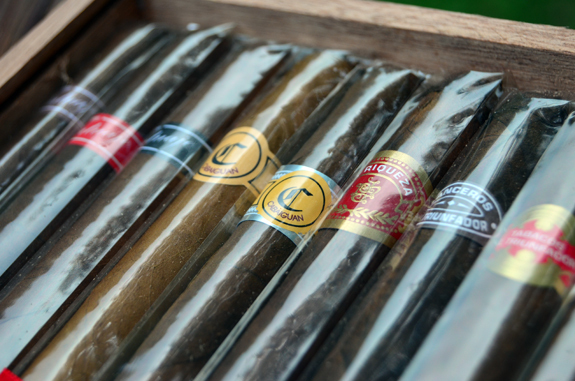 Just a complex, flavorful cigar to sit back and relax with. One thing I noted on this lancero was how big, deep draws brought out an overwhelming pepper, while a small shallow draw highlighted the nuances of this stick. As is the case with lanceros, you need to slow down your regular smoking pace to fully enjoy what this traditional vitola offers. I highly recommend you get your hands on these. You won’t be disappointed. Kudos to the Mrs.! I have yet to have either Cabaiguan in any size, but it sounds like a real winner. I would love to hear your take on the others in the sampler.